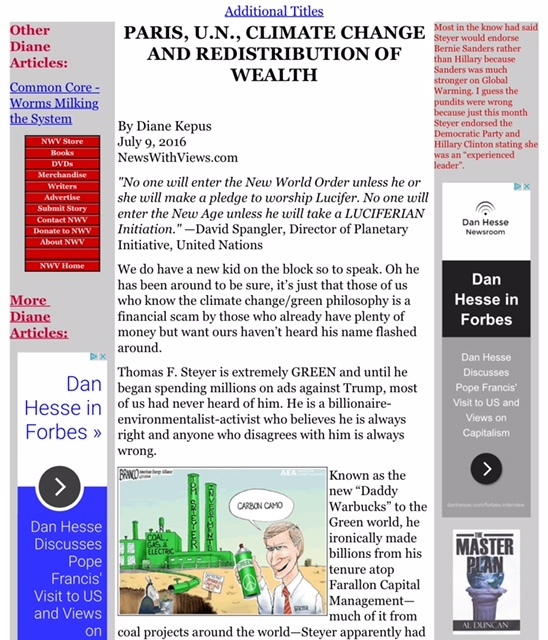 THE GREEN CORRUPTION FILES : Liberal Billionaire Tom Steyer: Dems' "cash for climate change"
Meet the latest wealthy political powerhouse, California liberal billionaire Tom Steyer, who has emerged as an environmental hero and major source of cash for Democrats. 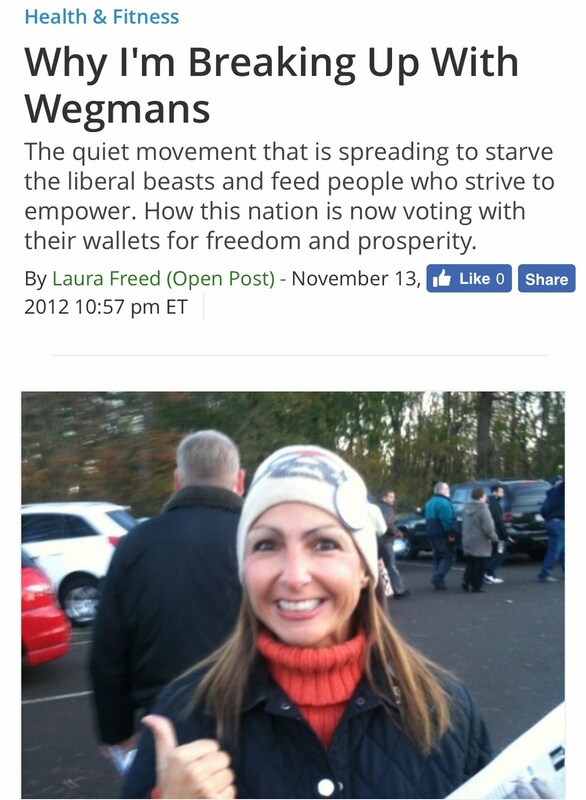 This is not just any Big-Bucks liberal. He's the extremely successful hedge-fund manager with oil and coal investments, turned ferocious climate change crusader, and is the notorious, outspoken opponent of the Keystone XL Pipeline. 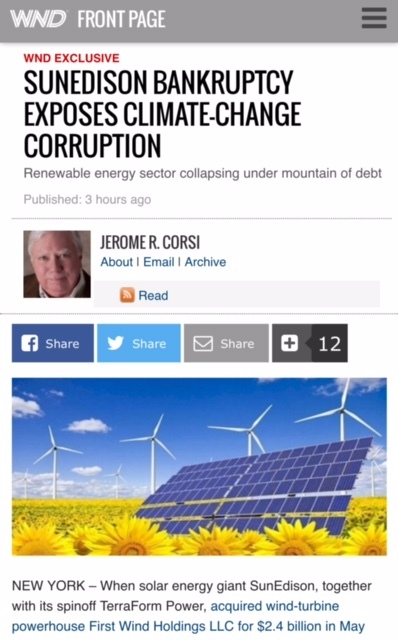 He is directly linked to the powerful left-wing think tank Center for American Progress (CAP) –– the dark, driving force behind President Obama's massive green energy scheme. 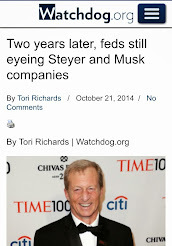 Steyer is two-time Obama bundler, a 2008 Obama "consultant," and a frequent White House visitor. 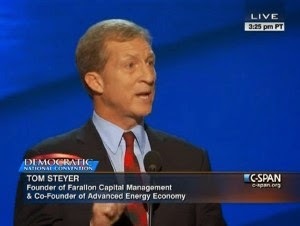 In 2012, Steyer was handpicked to make a cameo appearance at the Democratic National Convention and was even on the short-list to replace the departing Energy Secretary Steven Chu. 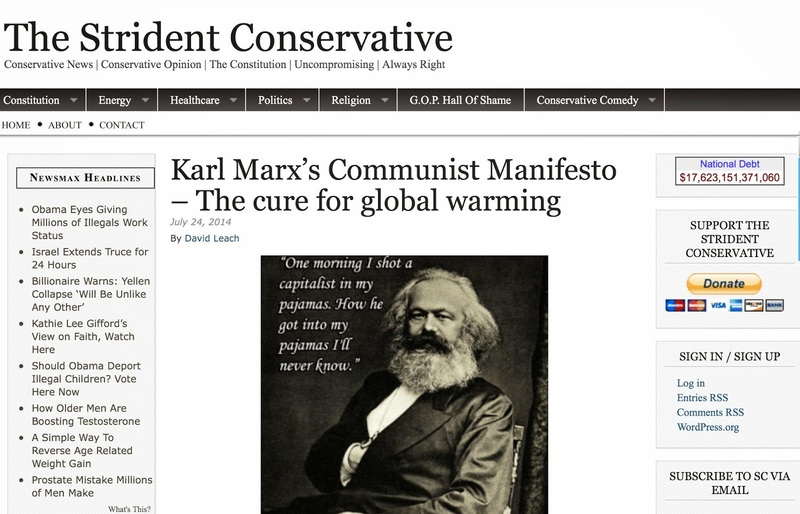 A darling of the Washington Post, they've label him as "the man that has Obama's ear when it comes to energy and climate change. 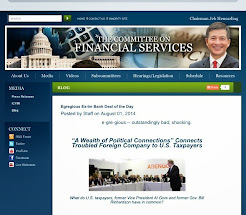 Steyer is helping drive policy in Washington." 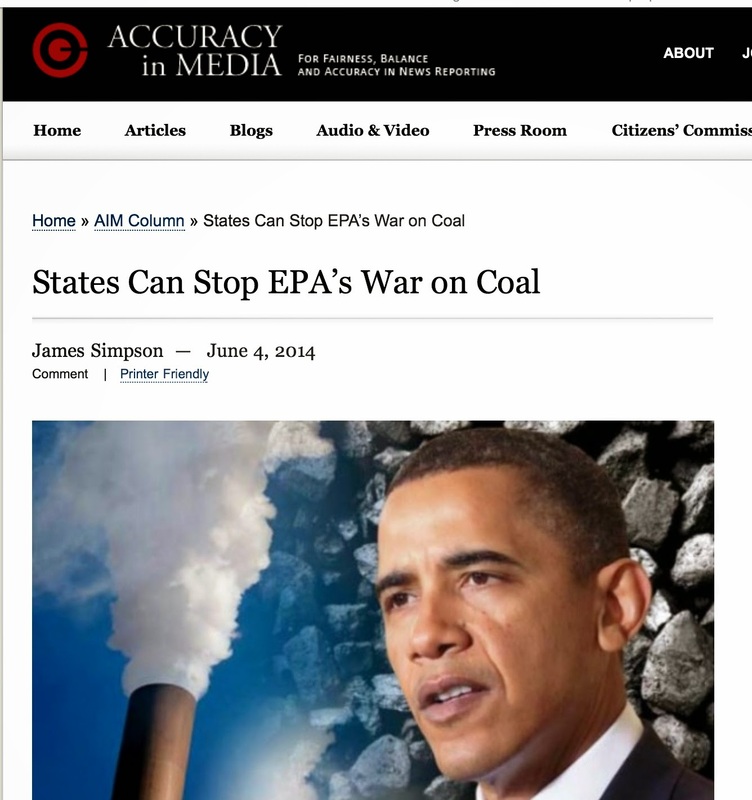 Even though he made a fortune in oil and coal, he's aligned himself with the president's "war on coal." 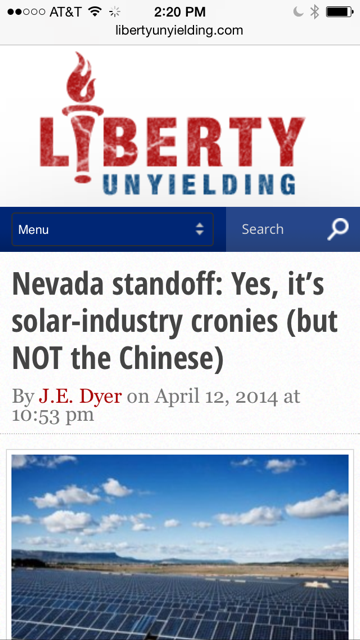 As John Hinderaker at Power Line appropriately puts it: "Tom Steyer was for coal before he was against it." 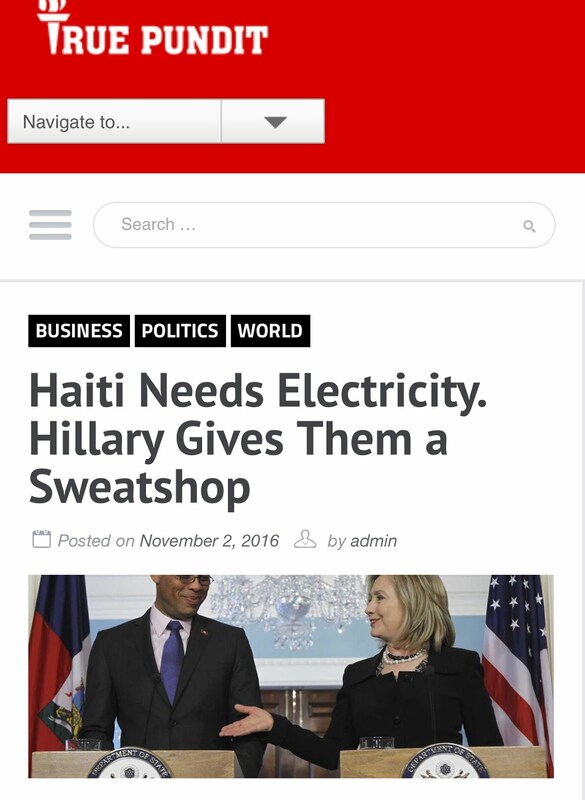 Additionally, his former mega-firm Farallon Capital Management, L.L.C. (“Farallon”) has an invested interest in a rival pipeline that would compete with Keystone. Steyer is a also big financial supporter for Greener Capital [now EFW Capital], a venture firm that invests in renewable energy, of which, so far, at least two of their green energy firms have snagged millions of free stimulus funds, Energy Department grants, and Department of Defense contracts. While he has been a strong and consistent Democrat donor for some time (occasionally to Republicans), as of late, Mr. Steyer has set his sights and tons of cash on the 2014 midterms, supporting Democrats who are partaking in his "war on climate change," while attacking Republicans he deems unfriendly to the environment. "The goal here is not to win. The goal here is to destroy these people. 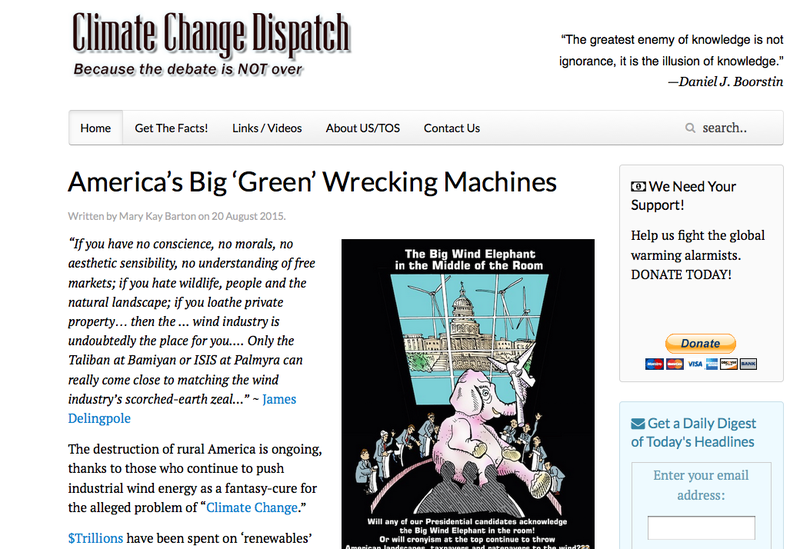 We want a smashing victory,” Steyer said of candidates he judges to be on the wrong side of the climate change debate. Those following the "green" money know that Steyer’s impact was felt not so long ago when he “spent millions on the 2013 Massachusetts Senate and Virginia governor’s races, helping Democrats Ed Markey and Terry McAuliffe prevail,” reported POLITICO. 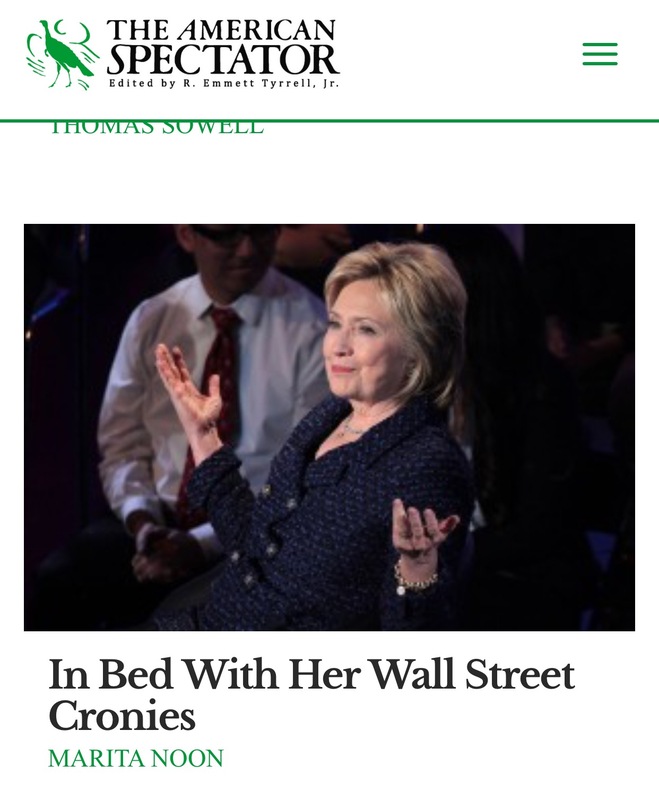 And, by the way, both Markey and McAuliffe have their own green corruption tails. About that same time (2013), Steyer founded NextGen Climate, whereas by February 2014, he laid out what The Guardian headlined as his “$100 million midterm attack on climate change deniers,” catapulting him “as a major player in the growing world of money and politics,” heralded POLITICO. 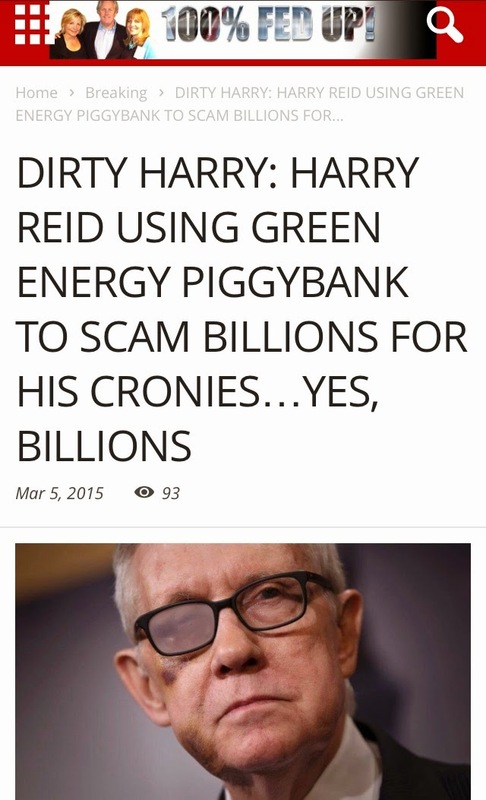 This despite the Left’s outrage over the Supreme Court’s 2010 Citizens United, as well as their bickering over money in politics –– with Majority Leader Harry Reid continually disgracing the senate floor with his "billionaire Koch Brothers" rubbish. 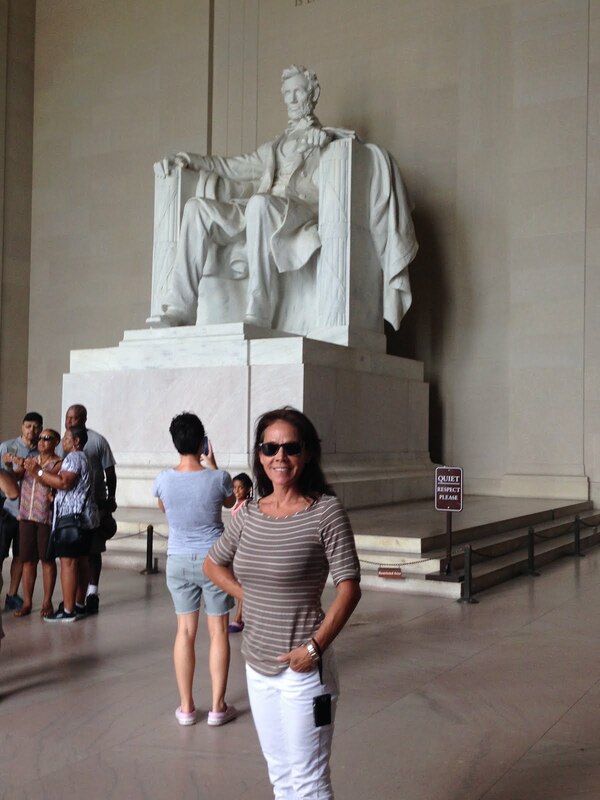 Even President Obama, "who long cast himself as an ardent opponent of big money in politics," scolded the Supreme Court's ruling on campaign finance reform during his 2010 State of the Union address. 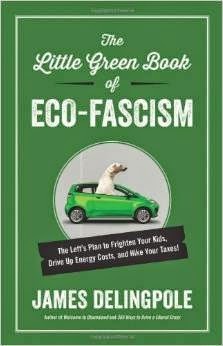 Worse is the Democrat's utter hypocrisy, denial and outright lies over their connection to huge amounts of Dark Money –– a fact that has been proven many times over inside this green energy scheme, and more dramatically in my July post on SolarCity on how the president's green revolution, using taxpayer money, is continually subsidizing millionaires and billionaires. Still, Steyer and his minions are not only waging war on the 2014 midterms, but they aim to shape the 2016 presidential election...and beyond. At the beginning of August, Steyer's NextGen released two new Florida television ads attacking Governor Rick Scott "over his ties to wealthy energy interests," reported the SaintPetersBlog. Unfortunately for those running this Eco-Super Pac, prior to unleashing these smear campaigns, they failed to do their homework. 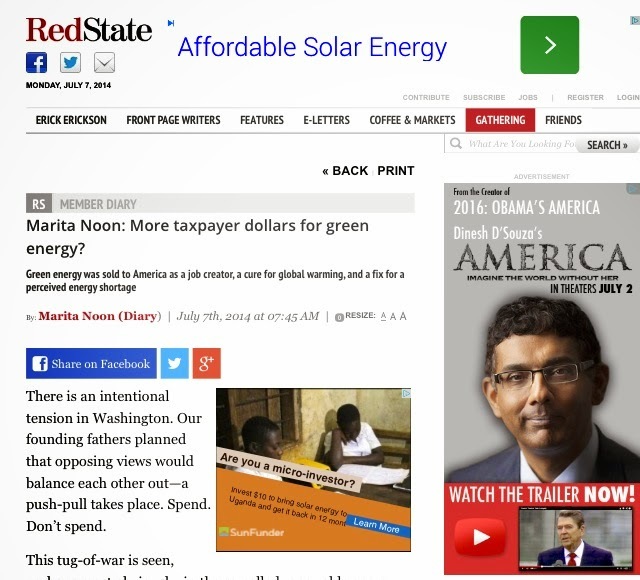 While Politifact rates the ad entitled "Shock," accusing Scott of "gleaning campaign funds from corporate polluters and energy interests that stiff customers," as "half true," this smear tactic didn't sit well with Scott's camp. Fox News reported that Scott "had his lawyer get a cease-and-desist order against it at a local Fort Myers television station. 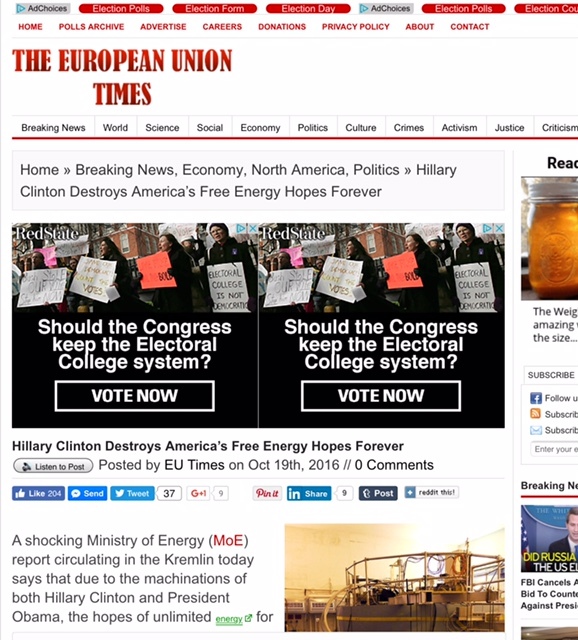 The ad was pulled." 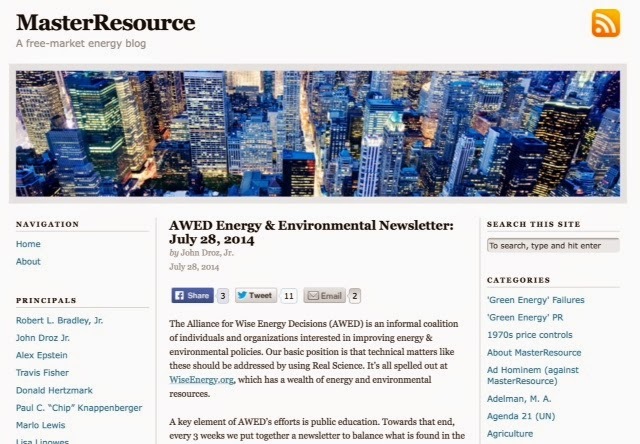 The "corporate polluters" in question are none other than Duke Energy. 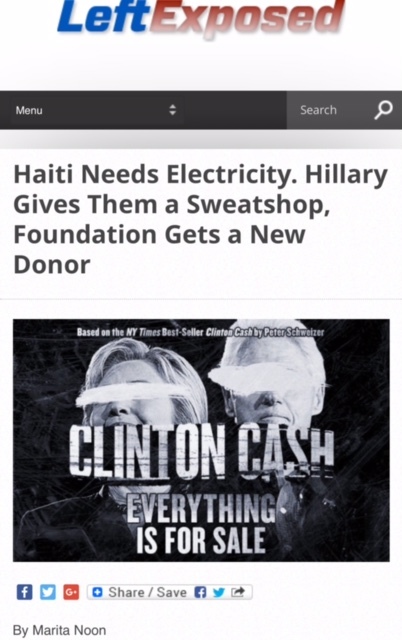 But the real shock is what the ad omits: Jim Rogers, the Chairman of Duke Energy, happens to be a top Obama supporter and donor. 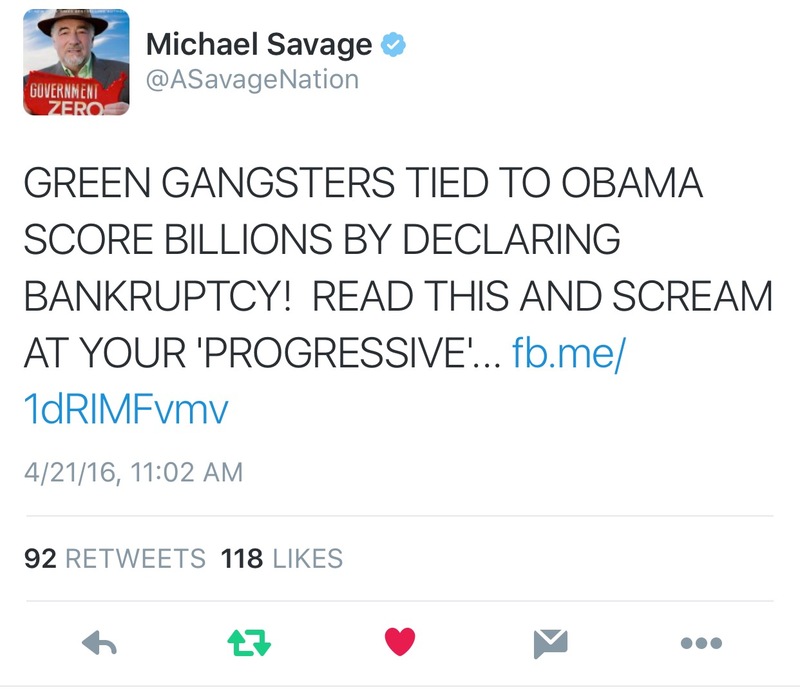 And Mr. Rogers made a special appearance at the 2012 Democratic National Convention along with three other wealthy "green cronies" that are tied to billions of stimulus funds, including... wait for it...Tom Steyer. Another NextGen Climate ad called "Secret" aims at Governor Scott's apparent ties to Big Sugar that was recently chronicled at SaintPetersBlog –– an ad that accuses "Scott of hunting for campaign contributions." From what I gather, this story stems from a "secret garden" that involves funding from "U.S. Sugar, Florida Crystals and Florida Power & Light," with claims that "all are direct beneficiaries of Scott’s policies." 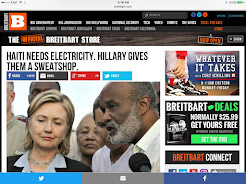 Needless to say, with a slogan that actually surmises Tom Steyer's political wheeling and dealing –– "Sweet deals for the Powerful Few" –– the ad doesn't mention Florida Power and Light (FLP). 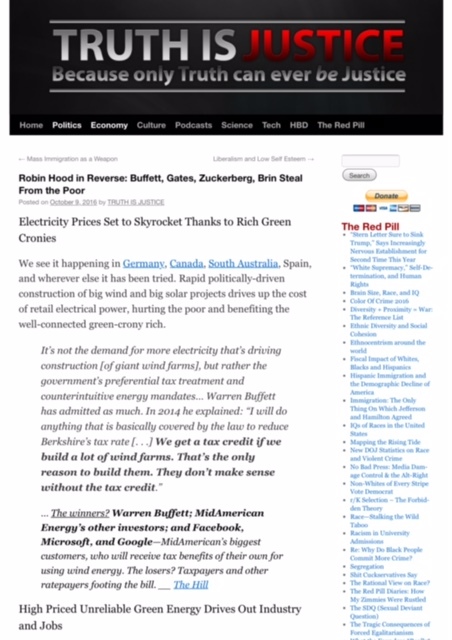 What the ad neglects to acknowledge (maybe they don't know) is that this large electricity company is a big beneficiary of President Obama's policies and the supporting funds –– more directly from the 2009-Recovery Act, commonly known as the stimulus package, whereas $100 billion was earmarked for renewable energy. 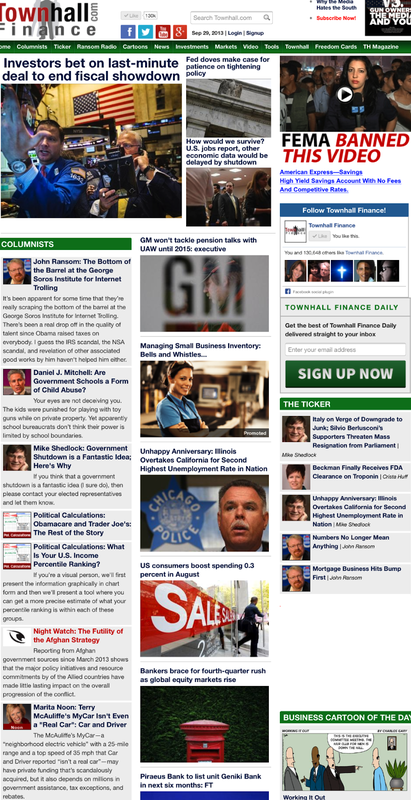 In October 2009, FPL was awarded the maximum stimulus grant amount of $200 million for Energy Smart Miami, which is a customer of Silver Spring Networks –– an investment of three Big Venture Capital firms with political friends in high places: Foundation Capital, Kleiner Perkins (John Doerr and Al Gore) and Google, which has cashed in big time from the stimulus package. Moreover, FPL is a subsidiary of NextEra Energy, which is the third largest power company in the world, and whose CEO Lewis Hay was close to the White House for some time as a member of the president's job's council. NextEra ended up becoming the third largest recipient of the Department of Energy risky stimulus loans, which includes these two projects: Desert Sunlight for $1.2 billion and Genesis Solar for $681.6 million. 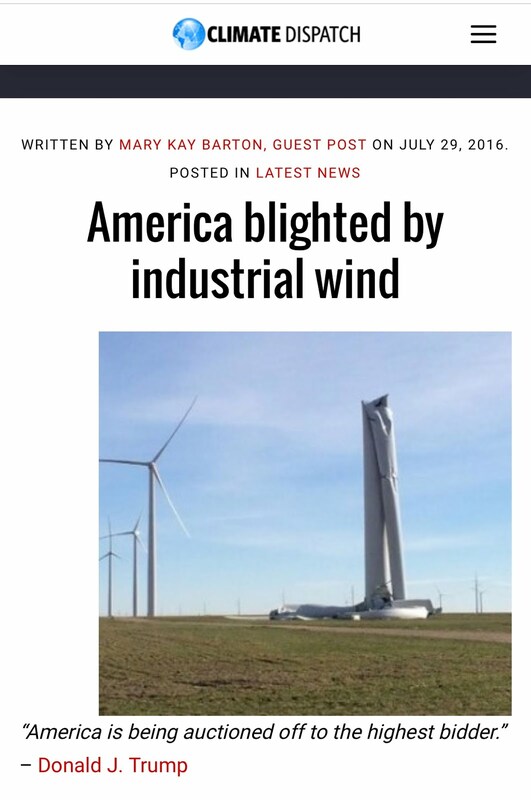 And that's not all: NextEra was one of the biggest beneficiaries of the Wind Energy Production Tax Credit, and they also snagged wind energy and other stimulus grants. 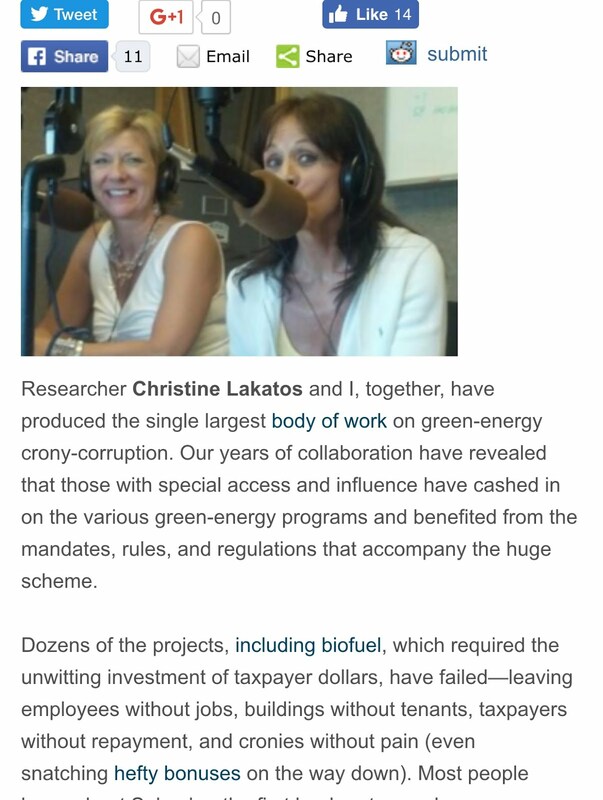 This information and more can be found in my January 2013 Green Corruption File. NextGen Climate also failed to mention that while Mr. Hay and FPL have a long history of political contributions (mostly Republicans), they had a very “cozy relationship” (even a 2008 wedding guest as well as 2009 donations) with career politician former Governor Charlie Crist —the Republican-turned-Independent-turned-Democrat, that recently won his primary, and is now running against Governor Rick Scott. Still, the Florida attack ads are just a sample of their handy work. Billionaire Steyer's climate change machine is also targeting New Hampshire Republican Senate candidate Scott Brown, "linking him" to the libertarian billionaire brothers Charles and David Koch and the oil industry. But what makes this comical (other than the billionaire rivalry) is that while Steyer recently "bought Harry Reid," these two (Reid and Steyer) are also fundraising pals and partners in killing the Keystone pipeline. 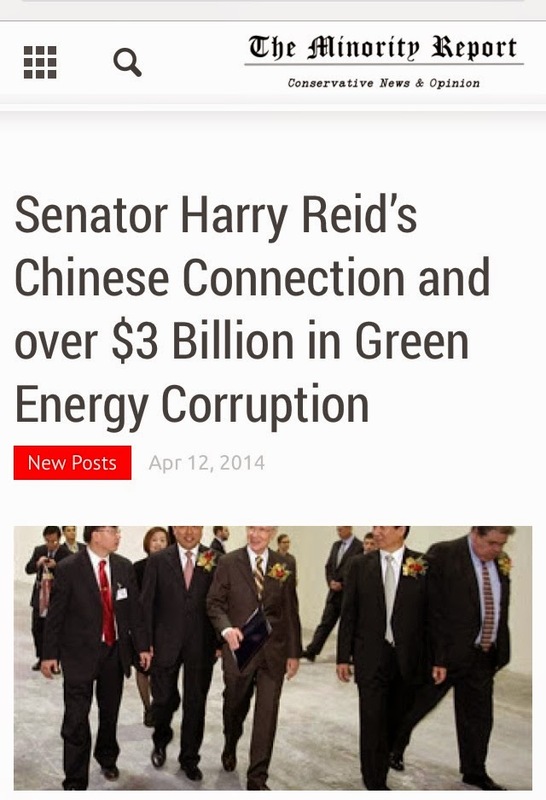 Moreover, as Steyer emerges as "the face of the liberal equivalent of the Koch brothers," Reid is the same senator that has been on a "jihad" against the Koch brothers for some time –– with Reid also the career politician directly linked to over $3 billion in green energy stimulus loans. 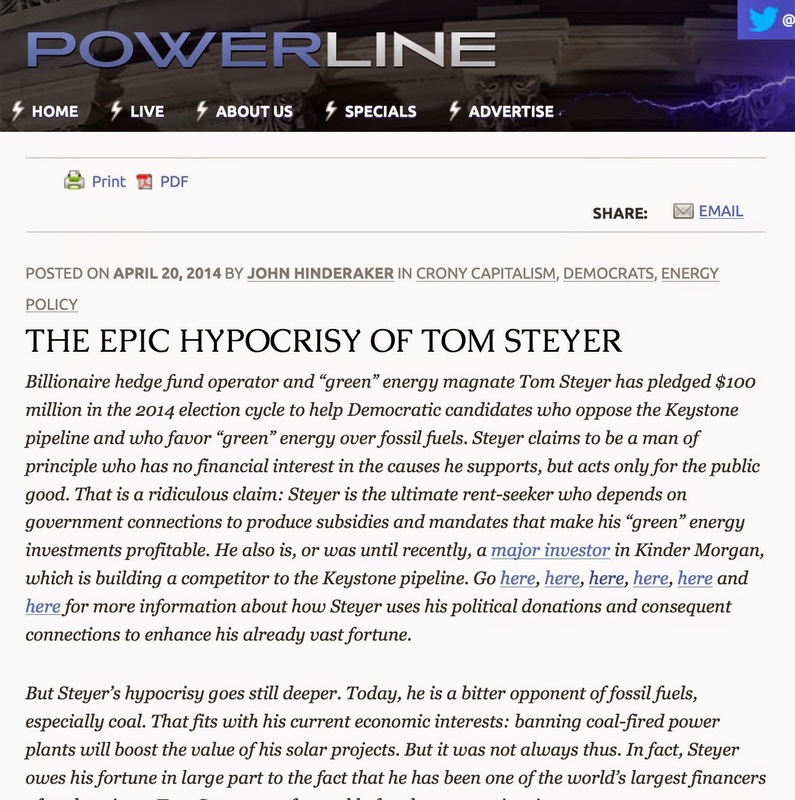 Meanwhile the folks at Power Line are keeping tabs on Steyer and his campaign cash, labeling NextGen Climate as “a global warming scare group, peddling pitiful science”–– and it seems that as of late, there's trouble in paradise. But Steyer is not only using his climate change machine to sway elections, he's spending big bucks in a "Bid to Rescue Democrats' Majority," headlined the National Journal last month. According to American City Business Journals (and documented by the Center for Responsive Politics), "Steyer leads the list of individuals who have donated the most to congressional candidates, parties and political action committees so far during the 2014 election cycle," placing that figure over $20.4 million to "Democratic and leftist causes." 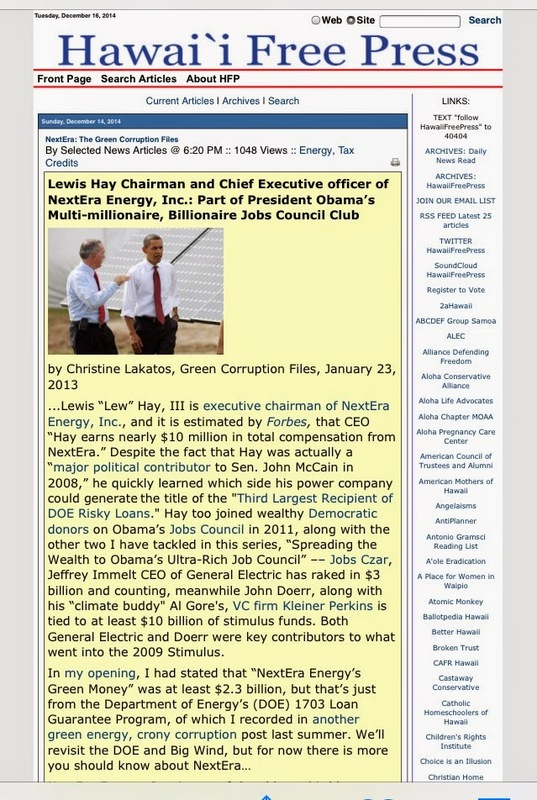 Money talks, but when you ad influence into the equation, it's even more powerful, marking Mr. Steyer as another "green corruption villain” that I've been following for a while –– even highlighting some of his involvement on September 2012, March 2013, September 2013 and March 2014. 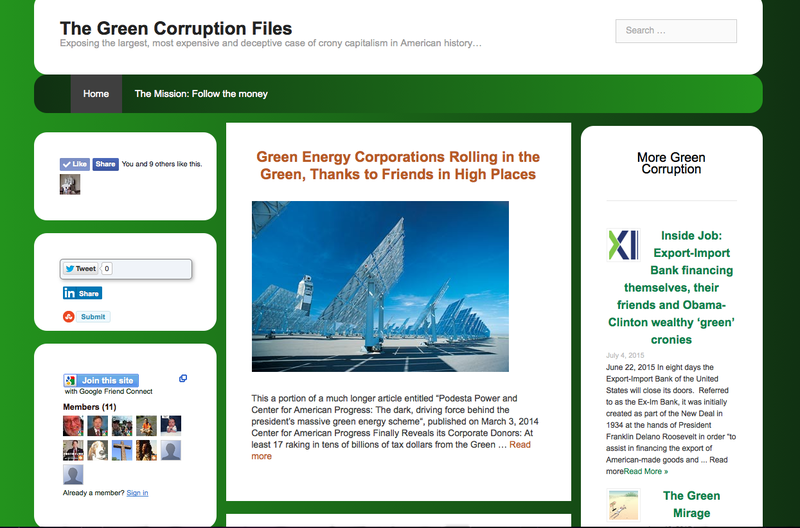 Although the beginning of this Green Corruption File presented an enticing brief bio on the billionaire from California, here's a look at some notable and more detailed points. 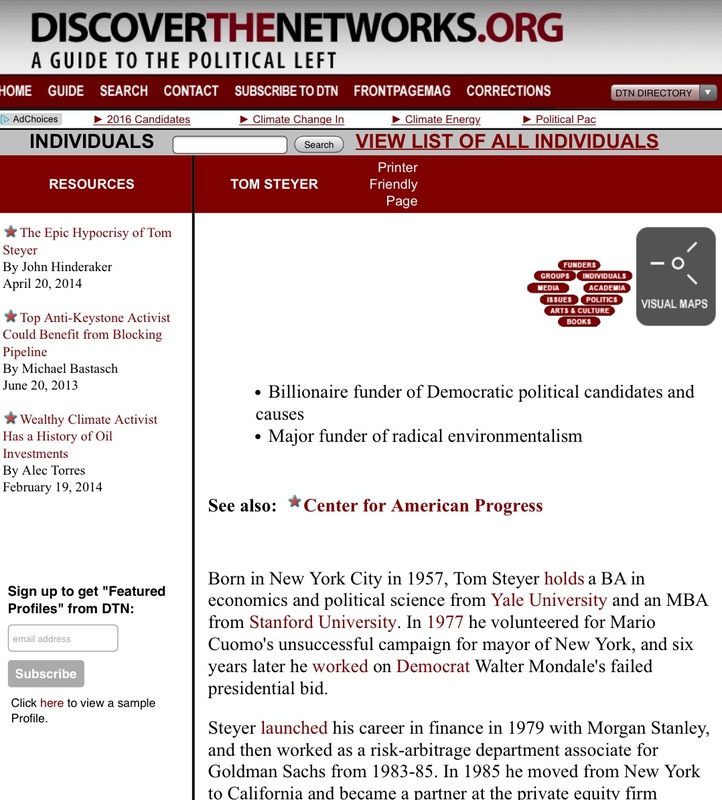 Mr. Steyer has been active in politics for some time, but what's interesting is that he has strong and expensive connections to the left-wing think tank Center for American Progress (CAP), who is closely aligned with the Obama administration –– even with CAP taking over key White House positions. 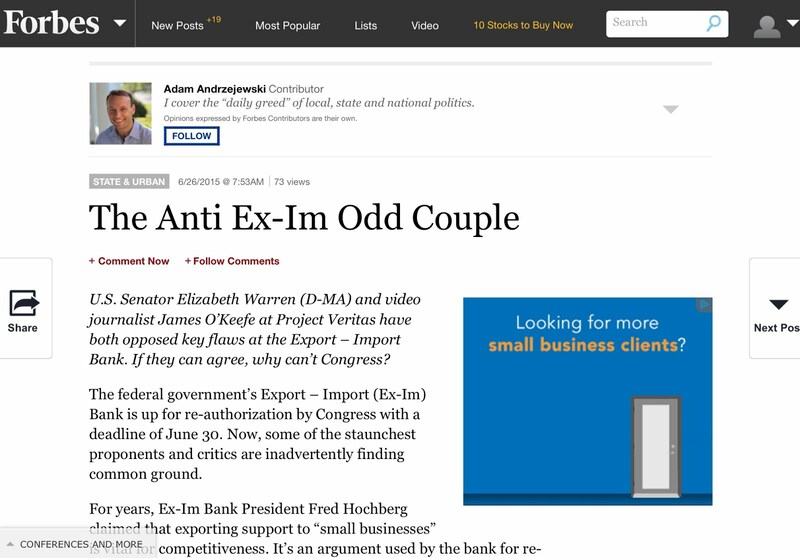 In their February 27, 2014 gushing spread of Steyer, the Washington Post shares a "look back at some of his most notable forays into American politics," which goes as far back as the '70s and '80s. The New Yorker even notes, "In 2004, Steyer raised significant funds for John Kerry, and in 2008 for Hillary Clinton" –– only to eventually end up as a two-time Obama bundler. 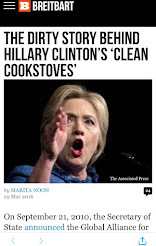 As of late, at Senator Harry Reid's annual energy conference in Las Vegas, the former Secretary of State Clinton and the likely 2016 Democratic frontrunner for president made her voice known with this statement: "Climate change is the most consequential, urgent, sweeping collection of challenges we face." Nevertheless what's relevant at this juncture is this: "Before Steyer got very involved in congressional races and ballot measures, he was already a generous donor to CAP, giving millions to the organization since its founding in 2003." The Post also notes that "Steyer is currently on CAP's board, and co-wrote an op-ed with John Podesta, the think tank's chair and founder, and a White House special advisor since last December." 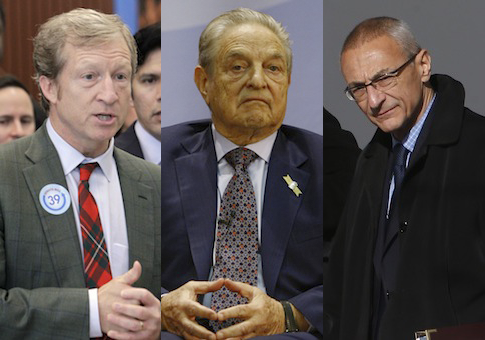 Just days after Steyer's $100 million bounty, he met with White House climate adviser Mr. Podesta… –– a meeting that "marked Steyer’s twelfth visit to the Obama White House," POLITICO reported. 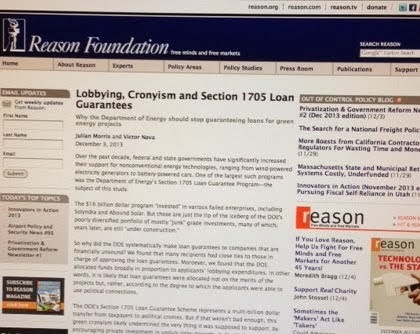 As revealed by the Washington Free Beacon, also in attendance at that meeting were none other than the liberal billionaire George Soros (another big CAP donor and green corruption villain) as well as "Michael Vachon, a top Soros lieutenant.” Additionally, The Beacon alerts, "Both Steyer and Soros are also involved with the shadowy left wing donor network the Democracy Alliance, which has steered large sums to CAP, one of its top dark money beneficiaries." 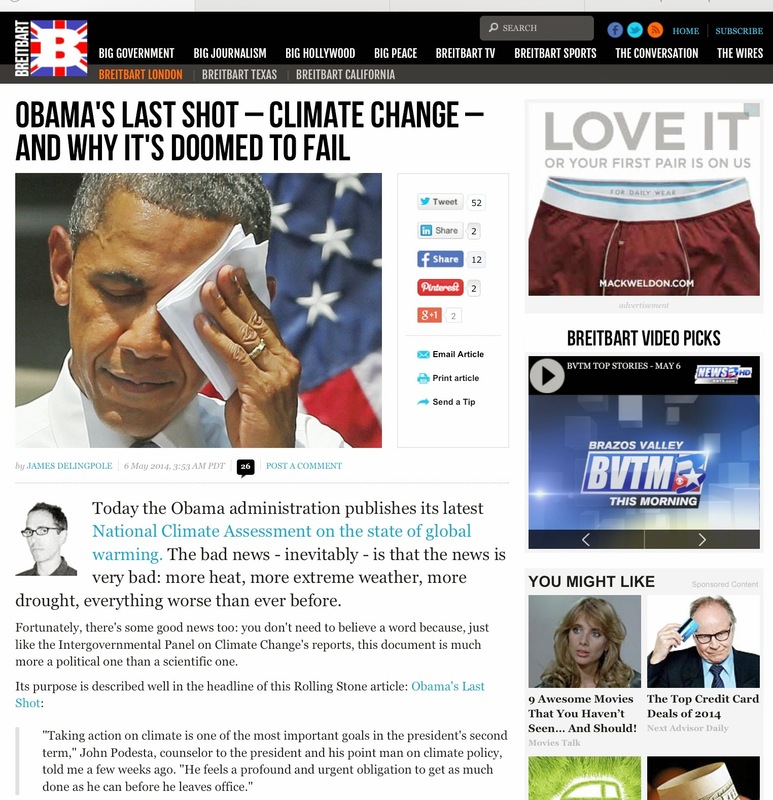 Those paying attention to President Obama's late 2013 pick of Podesta to serve as his "executive power czar" could read the tealeaves: We are smack dab in the middle of a climate change shift like no other. 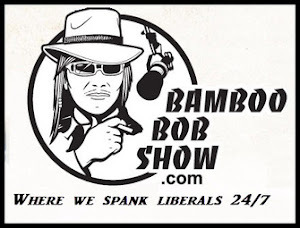 But Podesta and CAP have been in full operation inside this climate plot for some time as the dark, driving force behind the president’s massive green energy scheme. "This is about investing for the long haul, not for a quick-and-dirty buck," Steyer proclaimed. It's important to reiterate that at the time of this DNC speech, Steyer was the senior managing partner of Farallon –– the firm that he founded, which made him extremely wealthy with oil and coal investments (quick and dirty bucks?) that will be addressed in the next section. By January 2013, there were rumors circulating that Steyer was being considered as a possible secretary of Energy in the second Obama administration. 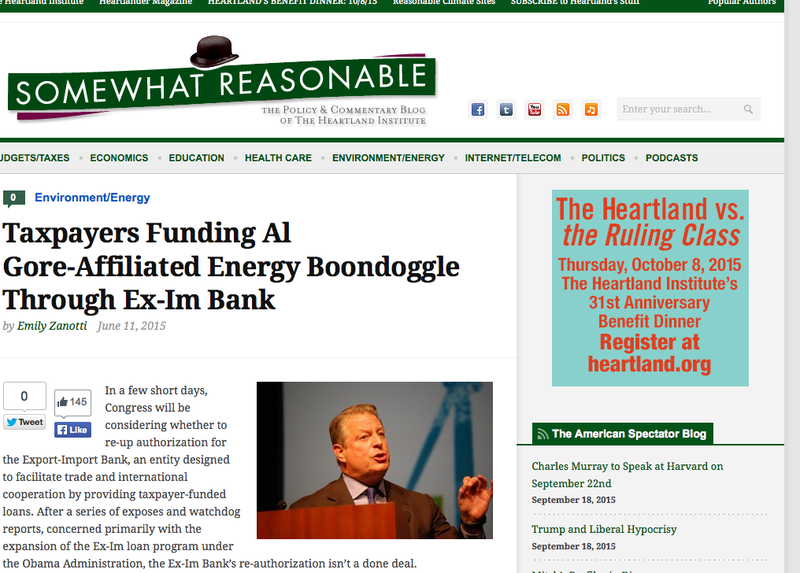 Obviously that didn't happen; that job went to Dr. Ernest Moniz. Yet, that hasn't stopped Steyer from influence with the Obama administration's energy policy, regulations, and most likely in stalling the Keystone pipeline decision. Besides Steyer's campaign cash, he has "considerable influence in the White House," pointed out the Washington Post in February 2013. From Steyer's wealth and political connections that have "played a critical behind-the-scenes role in helping shape the country’s national energy policy” to the fact that "he has spoken with President Obama about how to pursue climate and energy policy in a second term." In February 2014, The Post acknowledged that "[Steyer] still holds Democratic Party fundraisers at his house, sometimes with the president visiting, sometimes with former vice presidents visiting, always raising lots of money." 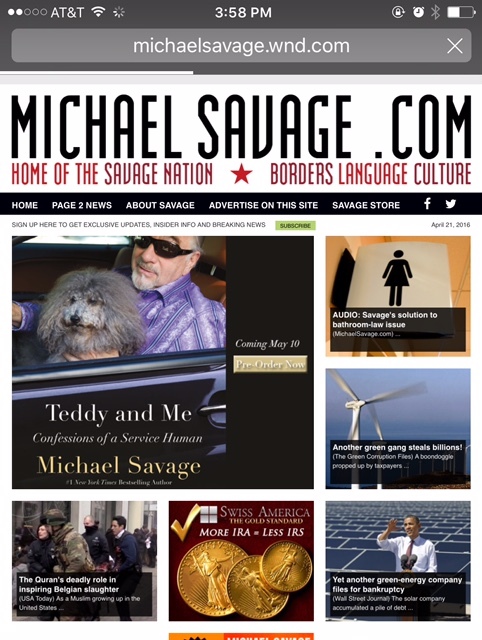 In April 2013, Steyer hosted a high-dollar fundraiser for our Campaigner in Chief –– even defending the president's intrusive and expensive, yet futile efforts to save the planet. This past February, the guest list included an appearance by former Vice President Al Gore, Majority Leader Harry Reid, other Democrats as well as some environmental groups. Of course, Reid, at that event, bashed the "billionaire fossil-fuel backers Charles and David Koch," however, not a peep on the source of Steyer's billions. “It’s all about public health and clean air,” he said. 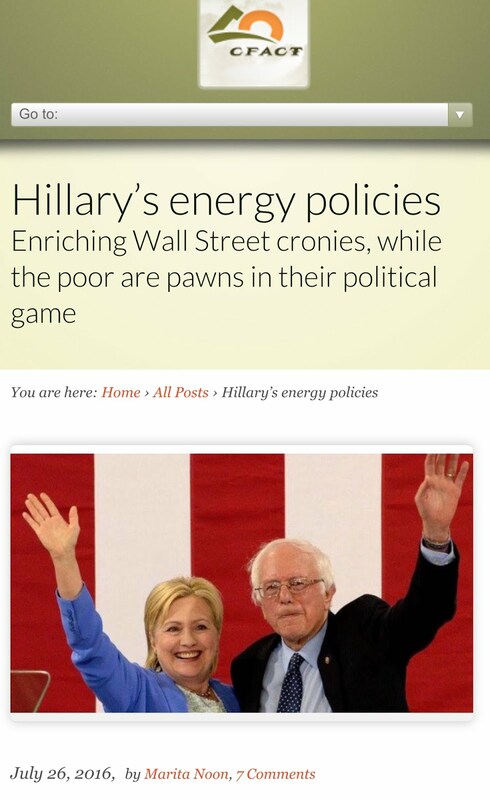 “It’s all about creating new jobs and really what we’re fighting is self-interested dirty energy companies." 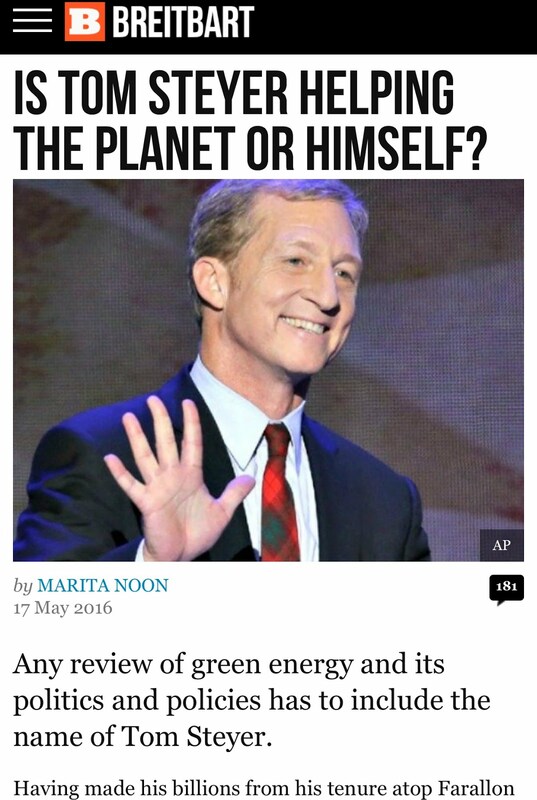 Steyer, the hedge-fund billionaire and megabucks Obama bundler and Democrat donor that was also a Big Oil investor, may be a true believer in global warming, man-made and otherwise, but the hypocrisy is palpable –– very well chronicled in John Hinderaker's April 2014 masterpiece, "The Epic Hypocrisy of Tom Steyer." But no matter how you slice it, Steyer has placed himself in a "win win" situation under the Obama administration, especially as they step on the gas with their climate change agenda, starting with the fact that Farallon has an invested interest in the rejection of the pipeline. 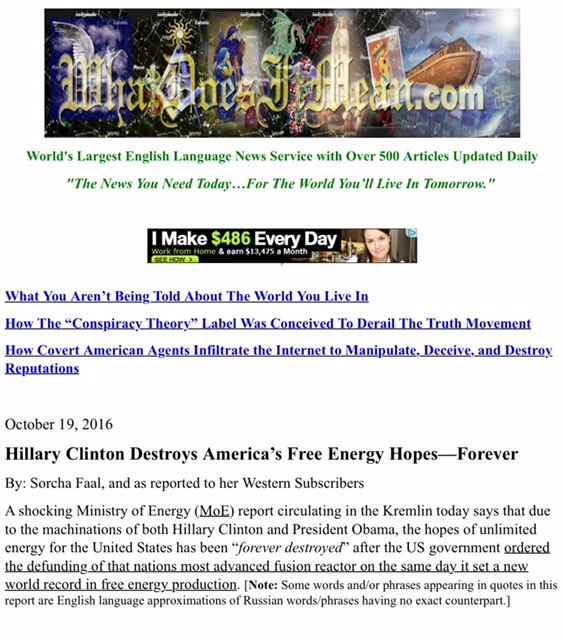 Additionally, according to the Washington Free Beacon, "Farallon stands to profit from government policies that increase consumption of natural gas." 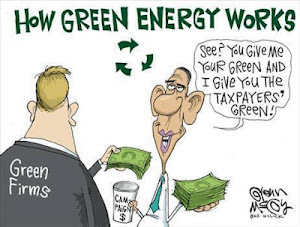 Finally, as a financial backer of Green Capital, now EFW Capital, which invests in alternative fuel companies, Steyer not only stands to benefit from the anti-oil policies of the Obama administration, but the tens of billion of subsidies being doled out to support green energy. While, I'm confident there is much more to expose, the next few sections will briefly address the aforementioned key areas and how they fit into this rich story. 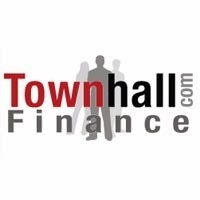 Farallon Capital Management, the investment firm that Steyer founded in 1986, "has grown to become one of the largest and most successful hedge funds in the United States with over $20bn in funds under management. 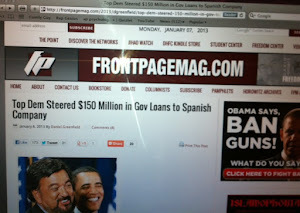 Mr. Steyer’s net worth is reported to be $1.6bn," documents Hinderaker. 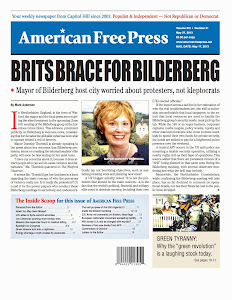 Mr. Steyer retired from Farallon in the fall of 2012 –– with some suggesting that this move was more political than ideological, because around that time he was being considered as Team Obama's second term Energy Secretary. 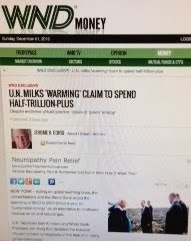 Then around the time that Steyer started his Eco-Super-PAC, "he said in July 2013 that when he had left Farallon, which manages much of his estimated $1.6 billion wealth, he had instructed the fund to divest his holdings in fossil fuels," reported Reuters. However, in the same May 2014 piece by Reuters, they note the following: "But he [Steyer] has provided few details of the extent of those fossil fuel investments or how he profited from them... 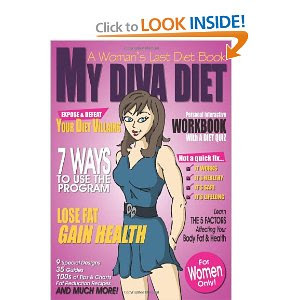 Neither he nor Farallon has said whether that process has been completed." 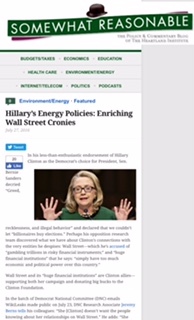 Meanwhile, the Washington Post, this past June, in an e-mail interview with Steyer spokeswoman Heather Wong, were given the following information: ".... since directing Farallon to divest the coal and tar-sands holdings, Tom expanded the divestment directive to include all of his fossil fuel energy holdings and as of this month [June 2014] he will be divested out of fossil fuels all together." 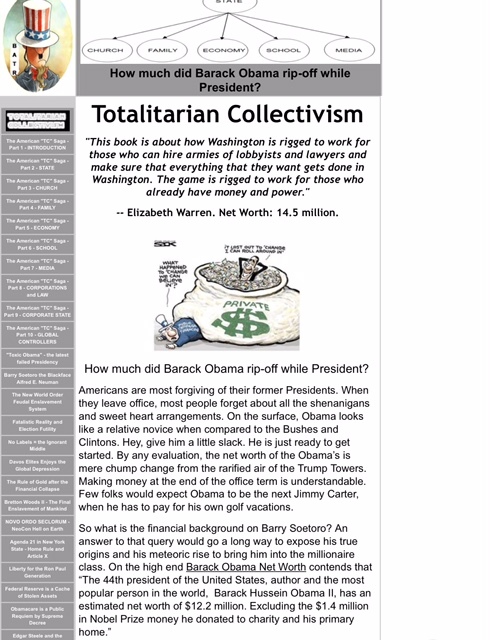 Now, it's unclear where that process stands today (September 6, 2014), but in looking back at a 2013 Daily Caller report, one of his investments stands out: That would be British Petroleum, the oil and gas giant, that according to POLITICO in 2010, was a huge 2008 Obama donor. 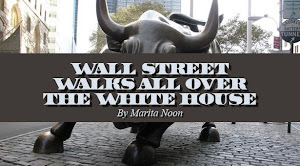 In a 2011 article by The Street, they noted the following: "Thomas Steyer, the billionaire environmentalist and founder of hedge fund Farallon Capital Management, initiated a stake in BP, the oil company responsible for the April 2010 spill in the Gulf of Mexico." What's interesting is that in 2001, BP began re branding to Beyond Petroleum (BP), and for a while they were heavily in the "green" business via BP Alternative Energy (biofuels, wind and solar). However, in the spring of 2013, BP switched gears and started abandoning renewable energy. 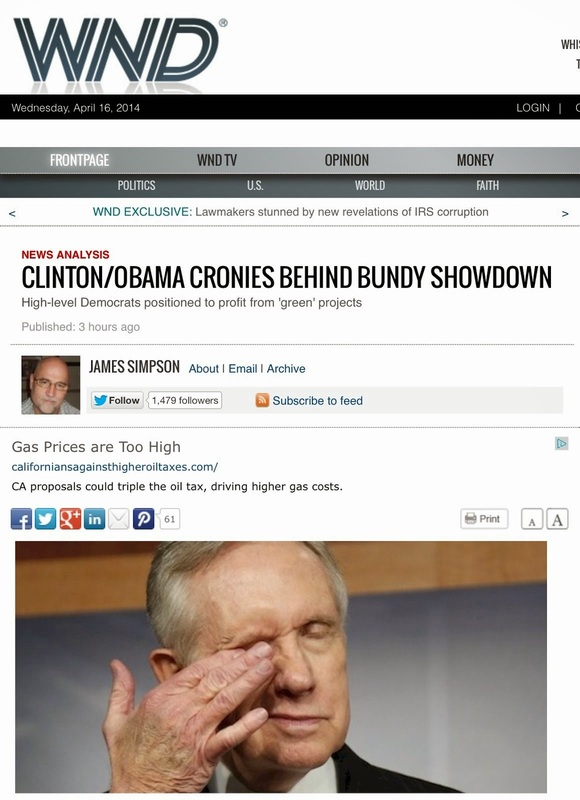 Still, that was after BP had snagged millions in "green" funds from the Obama administration, which I began to unravel in April 2013 due the fact that BP is in cahoots with Sempra Energy, the winner of a $337 million Energy Department stimulus loan for the Mesquite Solar Project in Arizona. 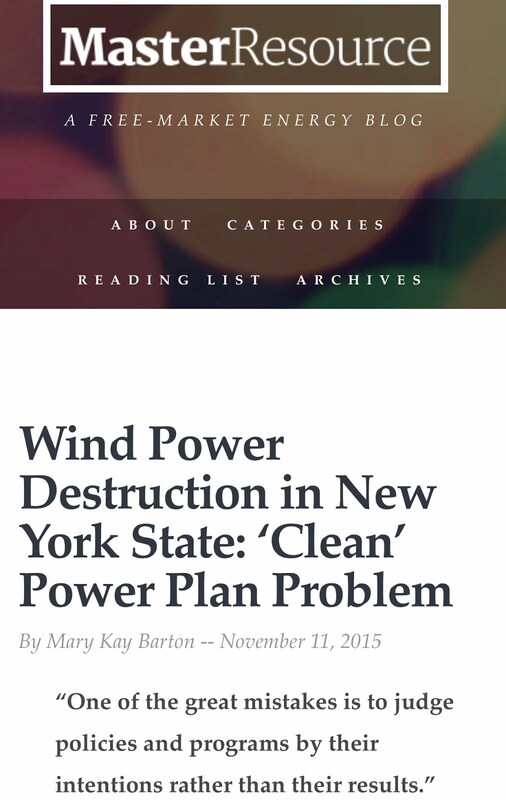 BP, at that time too, was part of all five of Sempra's wind projects. 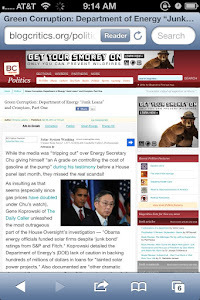 BP Alternative Energy is also an investor in BrightSource Energy, which was the winner of a $1.6 billion DOE stimulus loan that involves CAP corporate donors, a slew of additional Obama cronies, including George Soros, Department of Energy insiders as well as Senator Harry Reid that I tackled a few times –– more recently in my November 16, 2013 Green Corruption File. 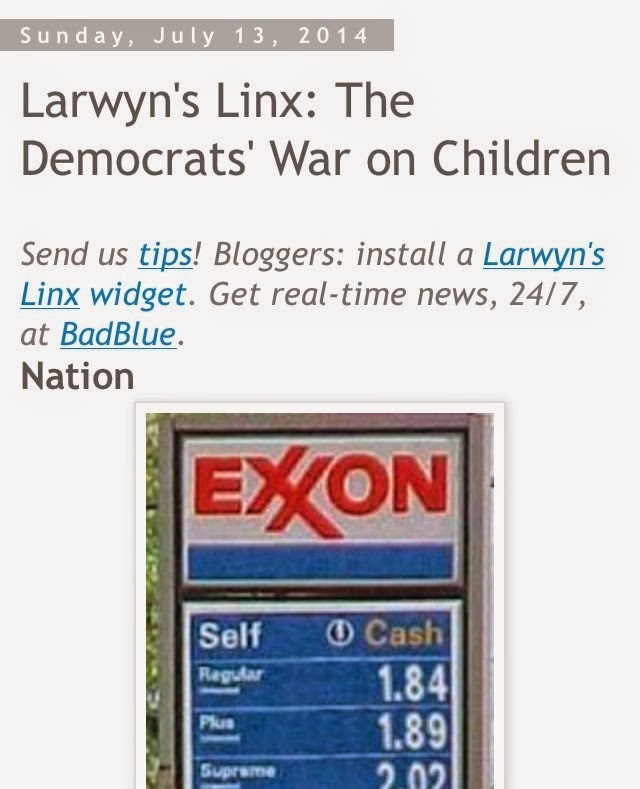 Besides BP, "among the oil and gas companies that Steyer and Farallon financed and got rich from were Energy Partners, Ltd., Link Energy LLC, Halcon Resources Corporation, Devx Energy, Inc., and a gold mining company named Global Gold Corporation," recently recorded by Darwin Bond-Graham at CounterPunch.org –– yet other oil interests can be found at Power Line's "Epic Hypocrisy of Tom Steyer" as well as Reuter's "From black to green: U.S. billionaire's 'Road to Damascus.'" Ironically, Steyer, the climate change crusader, made his fortune in what environmentalists deem as "dirty energy" (oil and coal), but also in natural gas and pipelines. 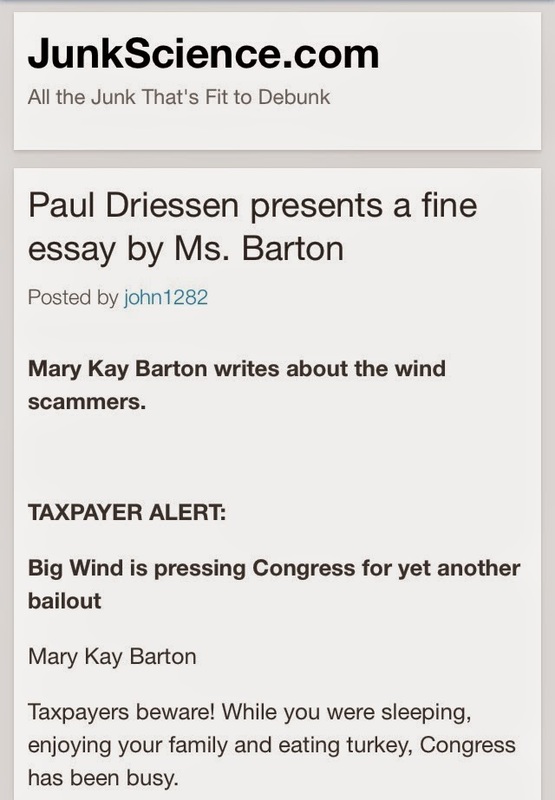 As reported by the Daily Caller in 2013, "According to SEC filings for the first quarter of 2013, Farallon has invested more than $300 million in companies that develop onshore and offshore U.S. assets and pipelines, including Halcon Resources, Kinder Morgan and Plains Exploration." It turns out that "One of Farallon's biggest holdings is in U.S. pipeline company Kinder Morgan, which has plans to expand a major competitor to the Keystone XL Pipeline Project — the TransMountain pipeline," noted Investors.com –– with more insight at the Washington Free Beacon's "Keystone to the Kingdom." So, it makes sense that "Steyer has mounted an extensive campaign to kill Keystone" –– even using his $100 million political ploy to attack those that support Keystone, while helping elect those (Democrats) who oppose it. Back in October 2013, Steyer joined two of his fellow CAP friends –– Carol Browner and Van Jones, both former "czars" from Obama's Green Team –– on a panel at CAP’s 10th Anniversary Policy Conference. This is where Browner predicted the following: “There will be some twists and turns” in the political debate over the pipeline, but "at the end of the day, he [Obama] is going to say no." 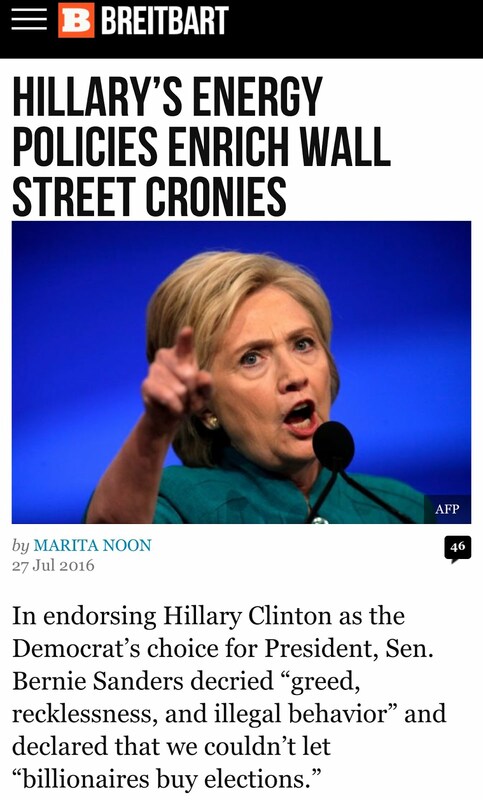 Meanwhile, The Post, in their June 2014 softball e-mail interview with Steyer spokeswoman Heather Wong, reported that Steyer is planning on donating "100% of his personal profits from Farallon Capital’s investments in Kinder Morgan." But the catch is that, despite clearing a major hurdle, the Keystone decision has been delayed for political reasons. Still, the Denver Post alerted last month: "There won't be another Senate vote on Keystone before the election because majority leader Harry Reid [Steyer's pal] won't allow one with some Democrats up for re-election in Keystone-friendly states." 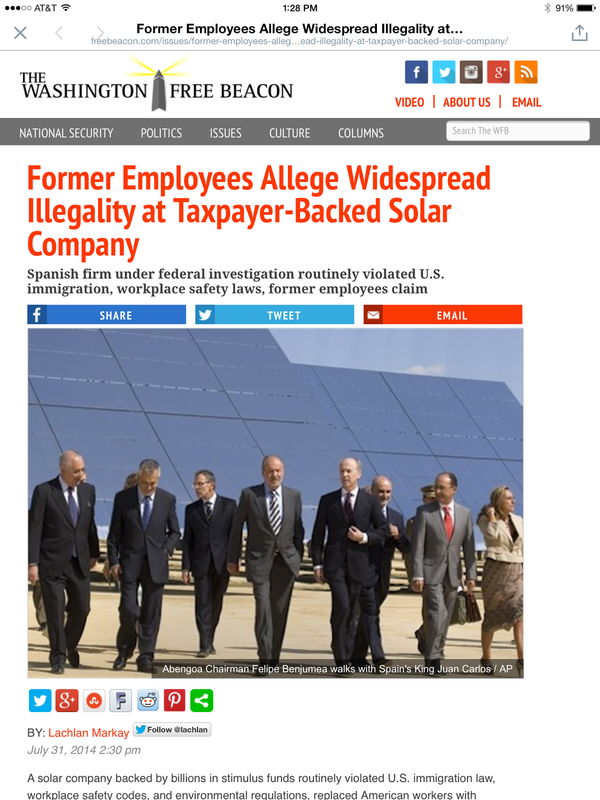 In late 2012, the Daily Signal noted that Steyer has been "an aggressive activist for more federal environmental regulation and taxpayer backing for green energy companies" –– even "consulting with the Obama administration after last November’s  election." 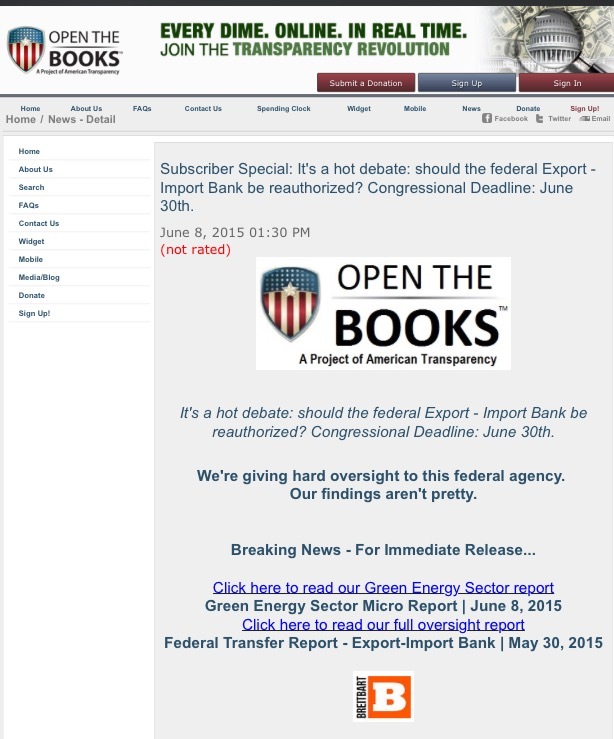 Even though this "consulting gig" was already mentioned earlier in this post, what's key here is not only Steyer's push for "green" regulations and taxpayer funds, but also his influence with Team Obama that dates as far back as late 2008. While Steyer "has contributed millions to charitable organizations that work on climate change issues," according to The Hill, he's also a "big financial supporter for Greener Capital [now EFW Capital], a venture firm that invests in renewable energy endeavors" –– an firm that directly benefits from the regulations and taxpayer cash Steyer has been pushing for. 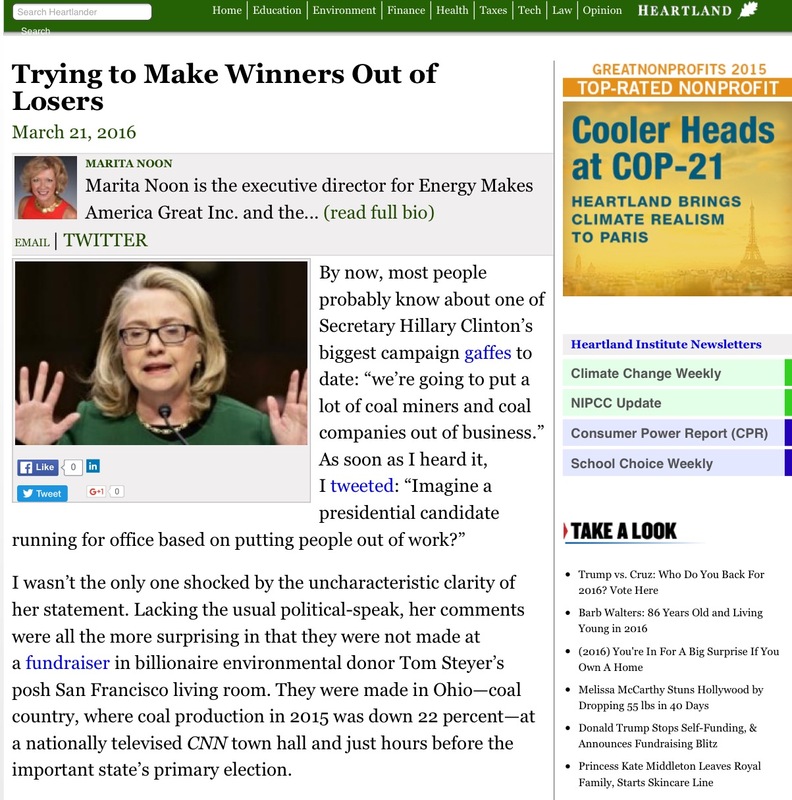 Forbes, in their 2011 profile of Mr. Steyer, reported that Charlie Finney runs Greener Capital. And according to Mr. Finnie's bio: "In 2008 Charlie founded Greener Capital Partners, the predecessor firm to EFW Capital, focusing on energy, food, and water innovation." Also an Investment Partner at EFW is Scott Jacobs, whom prior to EFW, "he co-founded and helped lead McKinsey & Company’s global CleanTech practice." 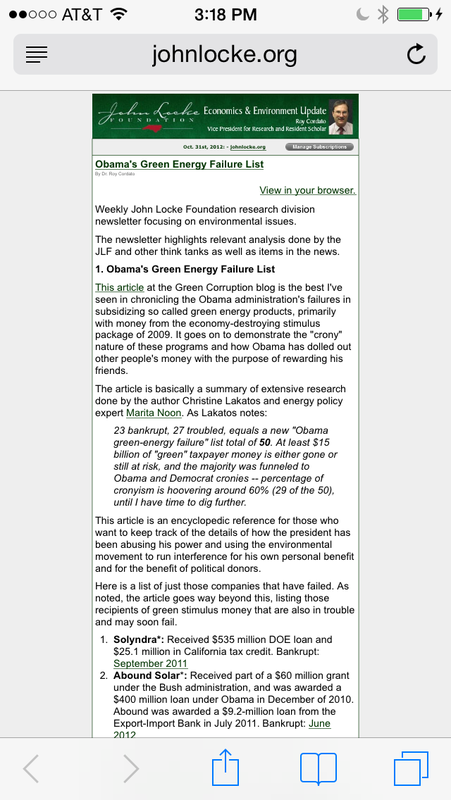 What's interesting is that folks from McKinsey & Company have been found inside the president's former Jobs Council as well as the clean-energy dirt, including, but not limited to DOE insiders such as Jonathan Silver, the former executive director of the Energy Department’s Loan Guarantee Program as well as Matt Rogers, the former senior adviser to then-Energy Secretary Chu. However, I have yet to connect the dots to what some refer to as The Firm, which even leads to a Clinton. Unfortunately, I was unable to locate an entire "green portfolio," but EFW claims that "Greener Capital has 12 portfolio companies, and Charlie sits on the boards of Sungevity, Electratherm, Project Frog, and PeoplePower." What stands out is Sungevity, which develops remote solar designs and installation services for home solar electric systems. After some digging, I discovered that Greener Capital is a major investor in Sungevity, participating in three sounds –– all beginning in September 2009. 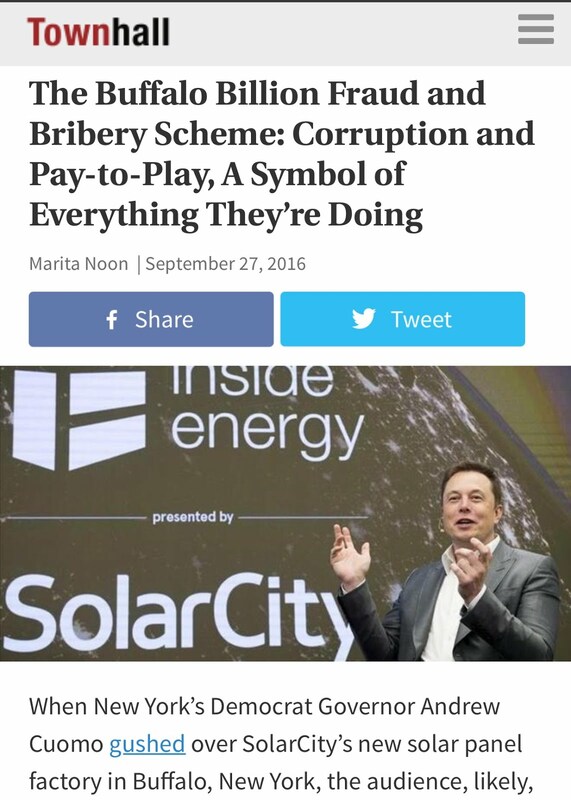 In December 2012, news hit casting a shadow over a trio of solar firms –– SolarCity, SunRun Inc., and Sungevity: They were under investigation for potentially inflating costs in order to draw down more money from a stimulus-funded loan program. But the kicker is that "all three boast investors with significant ties to the Obama White House," wrote the The Daily Signal. Translation: all three have friends in high places. 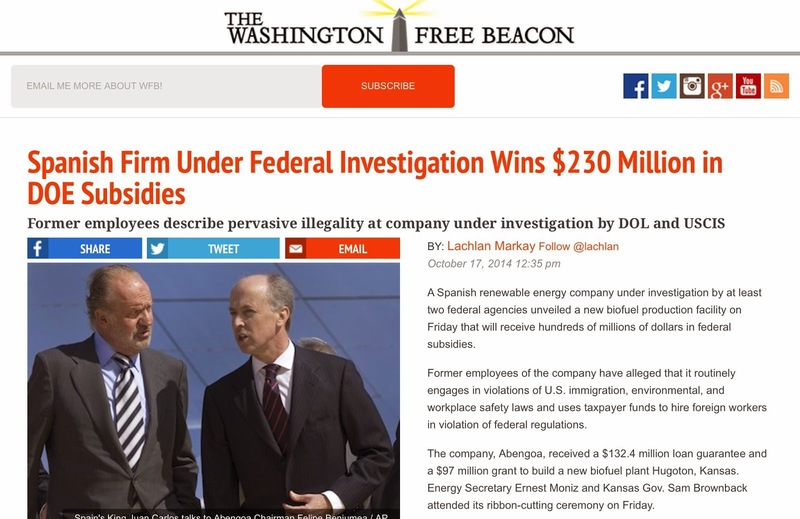 While it's unclear where that investigation landed, all three of these firms are also members of the American Council on Renewable Energy (ACORE) –– a renewable energy lobby powerhouse that had significant influence over the 2009-stimulus package, and the $100 billion green energy earmark. 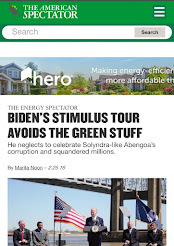 (NOTE: ACORE and all the other "Stimulus Authors" that benefited from the stimulus funds that I uncovered were detailed in my October 2013 Green Corruption File). ElectraTherm is the maker of the "Green Machine," which according to their site, "produces fuel-free, emission-free power from low grade waste heat using the Organic Rankine Cycle (ORC) and proprietary technology." 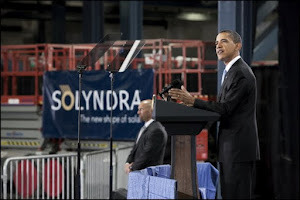 In an April 2011 Town Hall in Reno, Nevada –– hosted by ElectraTherm –– they got a "special shout out" by the president. 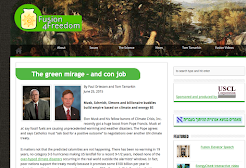 It seems too that this green company also snagged "approximately $1 million in Department of Defense contracts and a $1 million grant from the Department of Energy." Project Frog, a company that seems to be in the business of helping to "create beautiful and energy-efficient buildings," has its share of projects surrounding private deals. 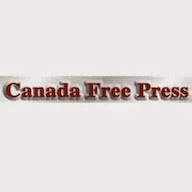 However, they have also been winning tons of public contracts such as the one announced on February 26, 2013: Project Frog Wins the Company’s Largest Public School Contract to Date." The question is: who's paying for all those public contracts? From the 2009-Recovery Act's $100 billion green energy earmark, to the "Climate Action Plan"... and all the way to the newly proposed climate change treaty that could catapult President Obama to a "virtual dictator"
As I've been alerting over and over... the Obama administration's deceptive and expensive climate change agenda has cost American taxpayers at least $150 billion, which factors in both stimulus and non-stimulus funds –– with the majority fueled by crony capitalism, corruption, outsourcing and failure. Along the way, the this administration has continually fired up new climate legislation, rules, regulations, and mandates, which benefit special interest groups while adversely affecting American families. More interesting to the Steyer story is that last July it was revealed by The Daily Mail that "environmentalists were allowed to draft Obama's White House energy policy." 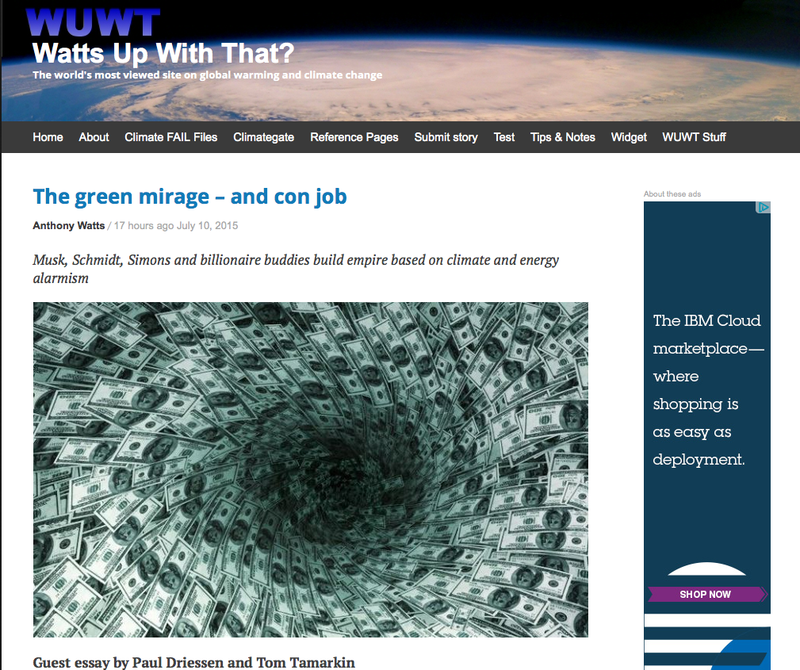 In particular, is "one of America's richest environmental activist groups," the Natural Resources Defense Council (NRDC) that is indirectly tied to the liberal billionaire via money (the “Billionaires’ Club”) and influence. The policy here is the president's 2012 aggressive and controversial Climate Action Plan, which calls for more clean-energy spending and environmental power –– with the majority being crammed through via executive fiat or the Environmental Protection Agency (EPA) in the form of regulations, and all without Congressional input. The centerpiece of President Barack Obama’s plan to fight climate change without going through Congress, the rules seek to limit carbon emissions from power plants, which form the largest single source of heat-trapping greenhouse gases blamed for global warming. Administration officials say the rules will give states reduction goals, then allow flexibility for states to meet those standards through an array of means and offsets. 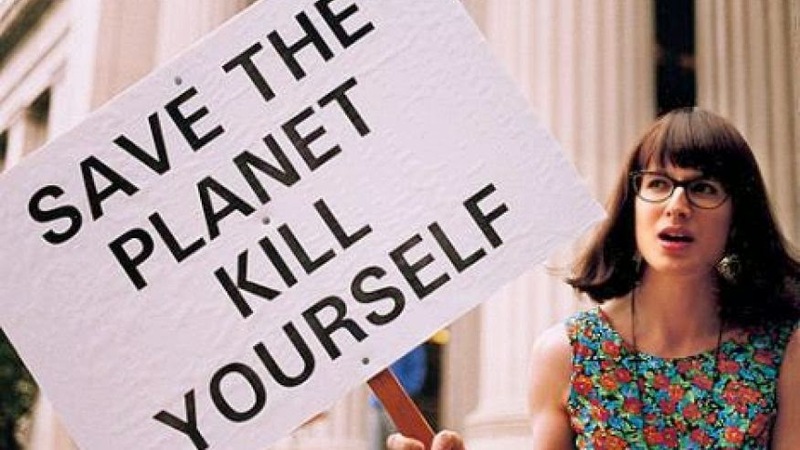 With so much at stake for many in this Climate Scam, even if the planet blows up, they will get their cap-and-trade, or a version of it –– a legislation that they helped create, shape, facilitate, lobby, testify, and will continue to push for because at the end of the day, they will ultimately benefit from it –– big time! 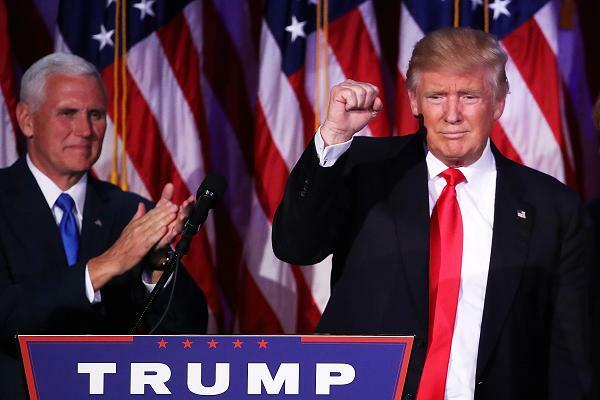 The latest data on what this means to the economy can be found at the Daily Signal here in this commentary: "Obama Is Bypassing Congress Again. 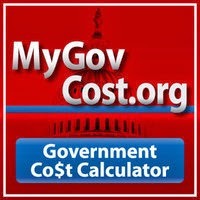 This Time It's Going to Cost You." And keep in mind that candidate Obama in 2008, warned, "Under my plan of a cap and trade system, electricity rates would necessarily skyrocket." But that's not the end, because the Eco-Rich are just getting warmed up: In June, the former New York Mayor Michael Bloomberg, former Treasury Secretary Hank Paulson, and Thomas Steyer, released a 56-page report entitled “Risky Business,” which warned that the planet is doomed in 15 years. Another sign came at the end of August when Tim Devaney at The Hill alerted that we should expect “the Obama administration to continue issuing controversial [environmental] rules through the midterm elections, despite the political risk it could pose for Democrats.” Moreover, Devaney followed up with this news: "Obama pushes green standards for everything but the kitchen sink." 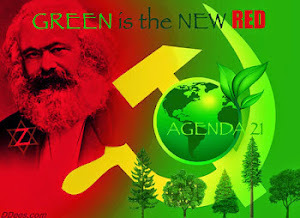 As the Obama Regime continues their fear mongering campaign, heralding, "Climate change is as big a threat to the world as terrorism, poverty, and weapons of mass destruction," they've even placed it ahead of the dire issues facing our Nation as well as the chaos that has enveloped the world. But don't fret, because on August 26, 2014, the president turned global warming into global dominance (which was the plan all along) when the New York Times reported this: "The Obama administration is working to forge a sweeping international climate change agreement to compel nations to cut their planet-warming fossil fuel emissions, but without ratification from Congress." 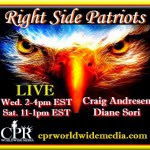 While this tyrannical maneuver could very well catapult Obama into a "virtual dictator," politically it isn't sitting well with "vulnerable Democrats" nor with some of the left leaning media –– and conservative pundits came out swinging. Washington Post columnist Charles Krauthammer slammed the idea, which is reported to be a push to reduce carbon emissions across the globe by some sort of "shaming system." Breitbart News quoted Krauthammer's reaction, where he not only called it incredibly stupid, but also "explained why he viewed the pursuit as being based upon 'adolescent idealism' and suggested that it wouldn’t work." 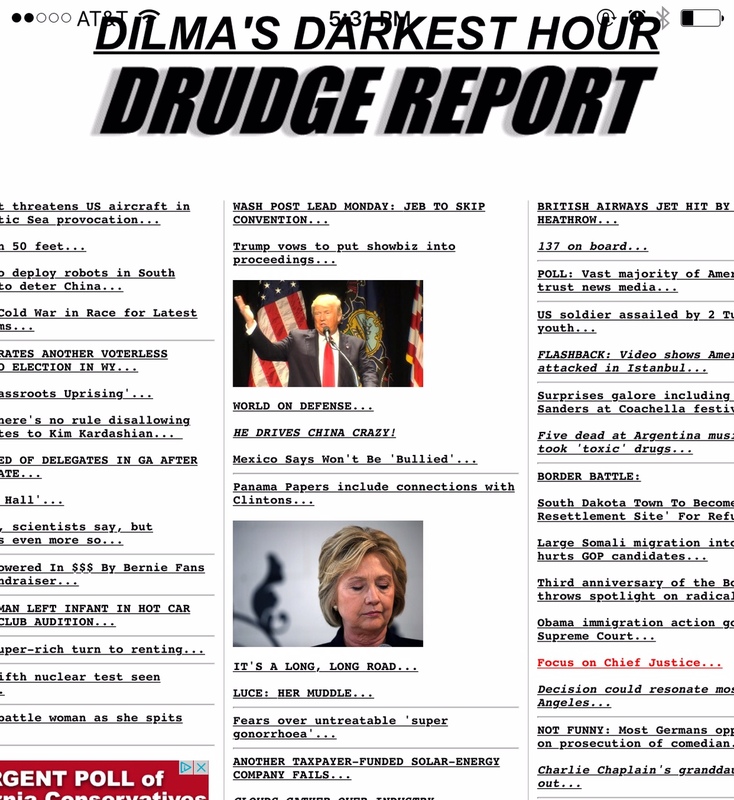 Meanwhile, James Delingpole from Breitbart London wasn't so kind in his piece, "Obama –– the Al Capone of Climate Change –– launches his next assault on democracy, the Constitution and the US economy." 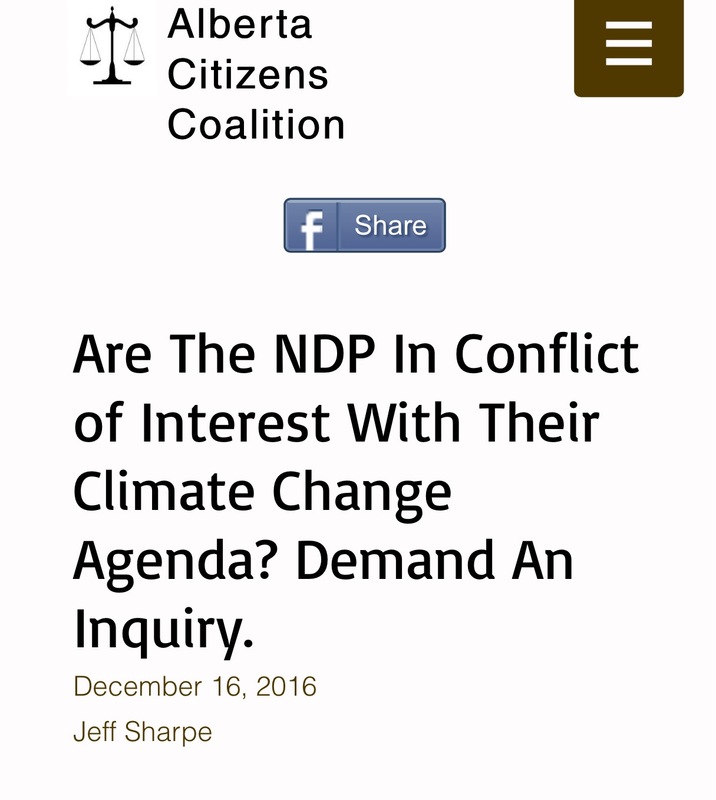 Disingenuous at best, because the entire climate change scam and the "green revolution" is run by one big special interest group: those with access and influence. 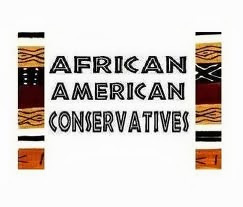 More specifically, the left wing ultra-rich that know how to play the game, starting with, but not excluded to dishing out hundreds of millions in cash in order to buy an election –– and all under the guise of “saving the planet,” just like Tom Steyer and the rest of the millionaires, billionaires, corporations as well as the eco-fascists and hypocrites behind the mask. 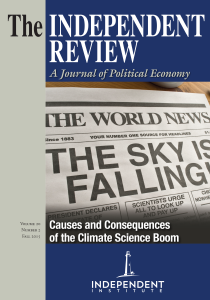 Most important is that while "Cash for Clunkers" (a Van Jones idea) cost jobs and the economy over $4 billion, the consequences that Steyer's "Cash for Climate Change" machine will have if it succeeds during this next and critical election cycle will be catastrophic. Even so, Steyer, his puppets and accomplices, while insisting that the "science is settled," are attempting to also destroy the debate on climate change –– but is it global warming or is the planet cooling? 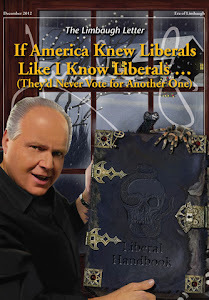 This too would be detrimental to our nation, because like Krauthammer, "I’m not a global warming believer. 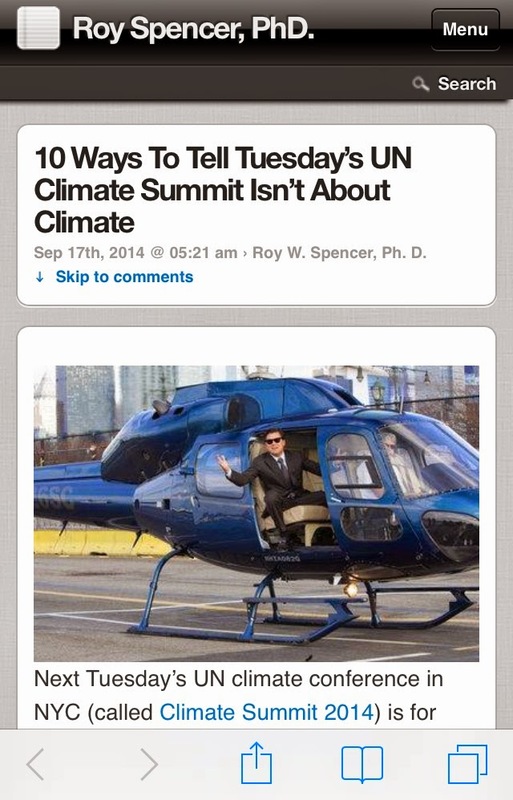 I’m not a global warming denier." But the truth is: the science is not settled. You should also know the five of the world’s ten biggest power companies are based in Europe; the remaining five are all based in the United States. You can see the list that profiles the world’s ten biggest power companies of 2014 based on Forbes calculation of net market capitalisation, assets, sales and profit.